Much like our baked parmesan crisps, today we bake white cheddar, and not as long, and create delicious filling and nearly carb-free soft taco shells. 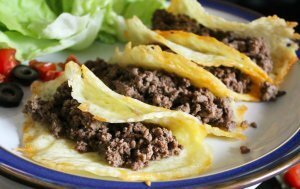 These taco shells are a delicious addition to your ketogenic Taco Tuesday, and hold all sorts of yummy taco fillings! Because we don’t bake these shells until they’re super crisp, they are pliable and there is no rush to turn them into a ‘taco shape’. They also are less crumbly, and easier for little mouths to eat. They reheat well too! Dairy-free these are not, they are made completely from cheese. Delicious if you can do dairy! If not, a lettuce wrap, or coconut flour ‘tortilla’ may be more your style. The post Easy Keto Baked Soft Taco Shells appeared first on Health, Home, & Happiness.